Should I Choose Injection or Blow Molding? When it comes to building custom carrying cases, there are two main types of manufacturing: blow molding and injection molding. Each molding type offers pros and cons. Choosing between production types is essential for getting the right case and staying within budget. Blow molding plastic is like glass blowing because it shares the same necessary steps. This manufacturing process creates high volumes of a single hollowed object. If you are making cases to sell or cases to promote a business, this could be the route for you. Blow molding can create thin-walled containers that are uniform. Injection Molding requires more upfront engineering than blow molding. Molds are formed from steel or aluminum, and then liquid polymers are added to the mold at high temperatures and under extreme pressure. 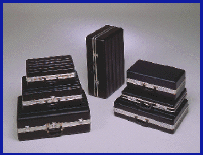 Both molding types are beneficial, but blow molding tends to make a robust and strong custom carrying case. For more information on which molding type is right for you, please give our engineers a call. We specialize in creating and building custom cases.